This is the OVW Saturday Night Special Report for Saturday, October 5, 2013. Tonight in the main event, Jamin Olivencia defended the OVW Heavyweight Title against James "Moose" Thomas where the loser must leave OVW! Plus, the Women's Title was on the line as Hannah Blossom defended against Lei'D Tapa, Michael Hayes & Mohamad Ali Vaez defended the Southern Tag Team Titles against the Best Team Ever, "The Pope" Elijah Burke defended the Television Title against Shiloh Jonze, Jay Bradley met up with Marcus Anthony, and much more! 6-MAN TAG TEAM MATCH: "The Marauders" Joe Coleman, Flash Flanagan, & Clint Poe (w/Raul LaMotta, Nick Dumeyer, & Shiloh Jonze) vs. Aaron Sky & "Double Platinum" Ryan Howe & Rockstar Spud. A lot of back and forth action. Aaron Sky got a hot tag and was on fire, but with the referee distracted by Double Platinum fighting the other Marauders, the masked Marauder ran out and cracked Aaron in the back with a chair, allowing the Marauders to get the pin. The Bodyguy comes out with his "Body Brigade" of Robo De Luna, J. Best, 4M, & Elvis Pridemoore, who are protecting him from the Assassin. He then issues an open challenge that is accepted by Rob Terry! Bodyguy says he misunderstood, he issued an open challenge for a handicap match. 5-on-1 HANDICAP MATCH: The Bodyguy, 4M, Robo De Luna, Elvis Pridemoore, & J. 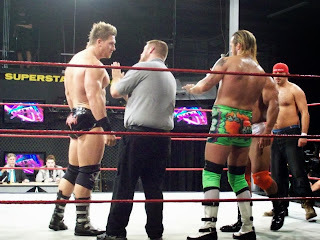 Best vs. "The Welsh Colossus" Rob Terry. Rob powerslams Elvis, overhead slams Best, chops down Robo, front slams 4M, and it comes down to him and the Bodyguy. Bodyguy runs to the back, but is brought back out by the Assassin. Rob hits a big powerslam on Bodyguy for the 3. WINNER: ROB TERRY by pinfall. Rob & the Assassin come face-to-face after the match, but shake hands. TAG TEAM MATCH: "The Justin Bieber of Professional Wrestling" Dylan Bostic & Stephon J. Baxter III vs. Eddie F. Diamond & Evan Markopoulos. Dylan yells at Stephon and tries to cheat, and Evan yells at EFD and tries to cheat. 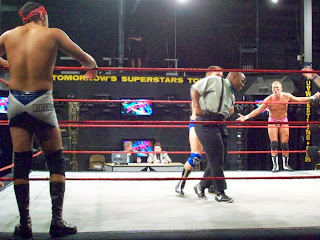 Stephon & EFD finally get fed up and tag Evan & Dylan, and flip them in the ring. EFD & Stephon both hit their partners, but Evan & Dylan knock both of them from the ring, and Dylan sneaks in behind Evan to roll him up with a handful of tights for the 3. WINNERS: BOSTIC & STEPHON by pinfall. Jay Bradley vs. "Strongest Gamer Alive" Marcus Anthony. Jay attacks Marcus' leg and works it over for most of the match, locking in a figure four at one point, and using the ropes for leverage. Marcus makes a comeback after Jay misses a kneedrop and a knee in the corner, hurting his own knee. Marcus locks in his own figure four on Jay and gets the tapout. 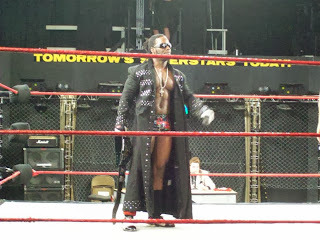 Michael Titus is in the ring for the finals of the "Miss OVW" contest. He brings out Lovely Lylah, and then Ray Lyn. As Holly Blossom makes her entrance, she is attacked from behind by Lei'D Tapa. Hannah runs out to check on Holly, and Tapa says that was a message. Tonight, it's her ring, her island, and Hannah will bow down! OVW TELEVISION TITLE: Shiloh Jonze (w/Raul LaMotta, Joe Coleman, Flash Flanagan, Clint Poe, & Nick Dumeyer) vs. "The Pope" Elijah Burke (c). The fans were hot for this match. Elijah is a great showman. Elijah dominates most of the match and is able to thwart off the Marauders on the outside, who are sent to the back by the ref. He delivers several chops and inverted atomic drops to Shiloh and looks to have him finished off after a flying elbow drop, but the Marauders (except for Coleman) run out to distract the ref. Coleman runs out from the other side and low blows Pope from behind, and Shiloh rolls him up for the 3. WINNER and NEW OVW TV CHAMPION: SHILOH by pinfall. OVW SOUTHERN TAG TEAM TITLES: "The Best Team Ever" Rudy Switchblade & "Mr. Pec-Tacular" Jessie Godderz vs. Michael Hayes & Mohamad Ali Vaez. A very good back and forth match with good teamwork on both sides. A lot of near falls, and in the end, Godderz tries to cover Hayes after the Best Finisher Ever. Unfortunately for BTE, the time limit runs out before he can get the 3. OVW WOMEN'S TITLE: Lei'D Tapa vs. Hannah Blossom (c). Hannah comes out swinging, angry at what she did to Holly. Tapa keeps knocking her away, but Hannah keeps coming back. Hannah locks in an arm submission twice, but Tapa flings her down and starts stomping away on her. Holly runs out and gets between them, but Hannah shoves her away and Holly says she doesn't want to see her get hurt anymore. Holly gets out and Hannah turns into the big boot from Tapa for the 3. WINNER and NEW OVW WOMEN'S CHAMPION: TAPA by pinfall. OVW HEAVYWEIGHT TITLE (NO DQ/LOSER LEAVES OVW): James "Moose" Thomas (w/Timmy Danger) vs. Jamin Olivencia (c). An excellent battle between 2 great stars. Chairs, kendo sticks, a garbage can, a Louisville Slugger, and a table all came into play. At one point, Danger & Moose taped Jamin's hands on the top rope, and Moose cracked Jamin in the back with a kendo stick. Later, Danger set up a table, but Jamin ended up knocking him through it. In the end, Jamin kicked a chair into Moose's face, and then hit him on the chair with the Standing O for the 3. 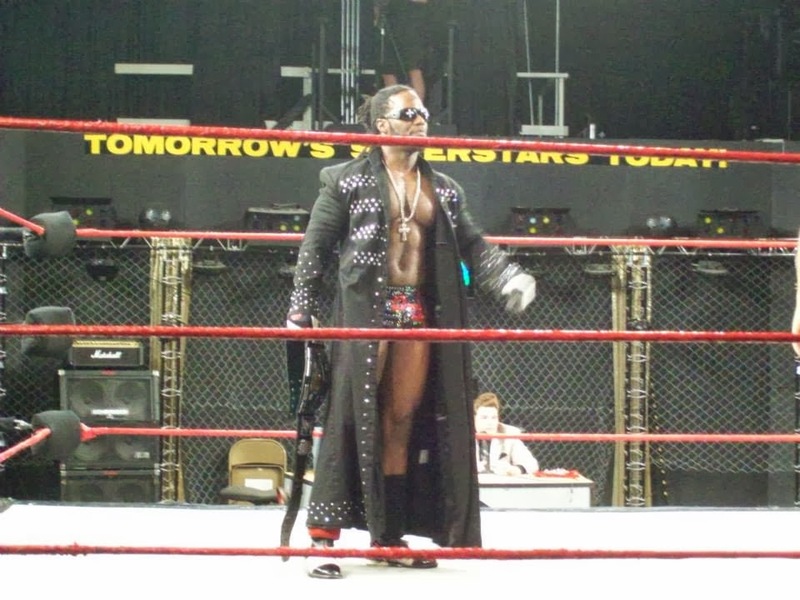 WINNER and STILL OVW HEAVYWEIGHT CHAMPION: OLIVENCIA by pinfall. Moose is gone from OVW! 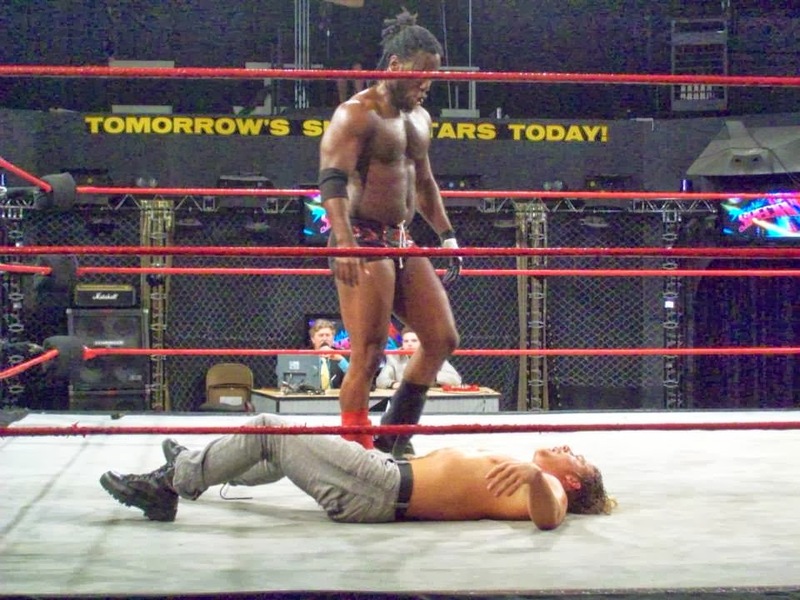 Thank you Moose for entertaining the fans of OVW over the last several years, you will be missed. This was a great and emotional match for the fans. Jamin is now the longest reigning Heavyweight Champion in OVW history and has issued a challenge to TNA Superstar and Olympic Gold Medalist, Kurt Angle! Will Kurt accept this challenge?